It's been a good year for frogs, the near-constant damp keeping them hopping and happy. At one perpetual puddle (meaning it was there for all but a few days since the spring melt), there has been a frog or two hanging around, sunning and swimming. 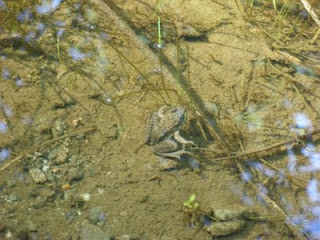 This one jumped in when we approached, clearly camouflaged in the three-inch deep puddle.